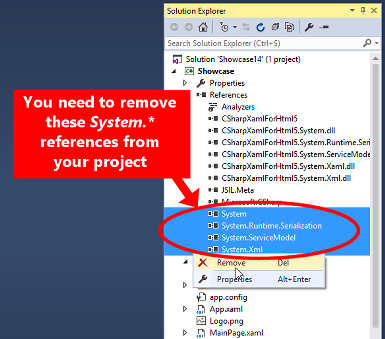 The "Add Service Reference" feature of Visual Studio. Use this feature to easily communicate with SOAP / WCF web services. See below for limitations and a tutorial. The "WebClient" class. Use this class to download strings from the web, as well as to communicate with REST / Web API web services. See below for a tutorial. IMPORTANT: the sample requires version 1.2 or newer. The sample shows a basic To-Do management application. When adding a WCF Service Reference via the "Add Service Reference" command of VS, VS may add unwanted references to your project, such as the "System" reference. You need to manually remove those references in order to be able to compile the project. The "Generate asynchronous operations" option (in the Service Reference Settings) cannot be used. However, you can use the "Generate task-based operations" option instead, which lets you make asynchronous calls via the async/await pattern. Alternatively, you can also make synchronous calls. i) Make sure you have the file "Global.asax.cs" in your server-side SOAP web service project. If you don't have that file, right-click the project name in the Solution Explorer, and click "Add" -> "Global Application Class". To see this code in action, follow the SOAP tutorial below. To see this code in action, follow the REST tutorial below. In Visual Studio, create a standard C#-based "Console" project (based on the latest .NET Framework) and try to reference your web service from that project. This is useful to know if the error is related to C#/XAML for HTML5 or if it is a generic WCF error. Install and launch the freeware "Fiddler" application to see what information is sent between the client and the server. You can compare this information with the information that is sent to/from the test Console application created above. This is useful to see if there are any differences between the C#/XAML for HTML5 implementation of WCF, and the pure .NET implementation. If you get the error "No 'Access-Control-Allow-Origin' header is present on the requested resource" when looking at the browser Controle log (F12), it means that the client and the server are not on the same domain and therefore you need to add support for CORS on the server. To do so, read the CORS-related section of this page. 1) Create a new project of type "WCF -> WCF Service Application". Let's call it "WcfService1"
6) In a new instance of Visual Studio, create a new project of type C#/XAML for HTML5 -> Empty Application. 7) Click Project -> Add Service Reference, and paste the URL of the service that you created above. It should be something like: http://localhost:4598/Service1.svc where you must replace 4958 with your port number. Click GO and then OK (leave the default name "ServiceReference1"). 8) Manually remove the following references from the project references: System, System.Runtime.Serialization, System.ServiceModel, System.Xml (and any other DLL that starts with "System."). 11) Click "Start Debugging" to test your client/server To-Do items application. 1) Create a new project of type "Web -> ASP.NET MVC 4 Web Application" (or newer). Let's call it "MvcApplication1". When you click OK, a second dialog appears that lets you choose a Project Template. Be sure to select the "Web API" project template. Makes sure the option "Create a unit test project" is NOT checked, and click OK.
4) Right-click the folder "Controllers" and click "Add -> Controller...". Enter the name "ToDoController" and choose "Empty MVC Controller" in the "Template" drop-down. Then click OK. Note: the name of the controller is very important because it will have a direct impact on the URL of your REST web service. ReasonPhrase = "ID not found"
ReasonPhrase = "The ID must be the same as the ID of the todo"
9) Click "Start Debugging" to test your client/server To-Do items application.